The LUN masking mechanism is used to configure required security policies to present the storage LUNs to only those systems and cloud storage devices that require access via the interfaces and configuration options provided by physical storage vendors. This mechanism can be established via the use of security features that are delivered by a physical storage device as managed by cloud storage resource administrators. Some storage vendors also provide APIs used as an interface for automatically or manually configuring security policies. 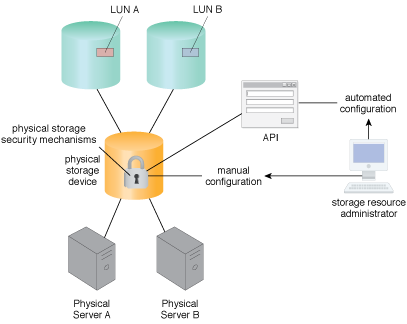 In the example in Figure 1, a storage resource administrator uses either the provided API or a standalone management interface to define policies for Servers A and B to interact with the LUNs presented. Figure 1 – An example of the LUN masking mechanism.